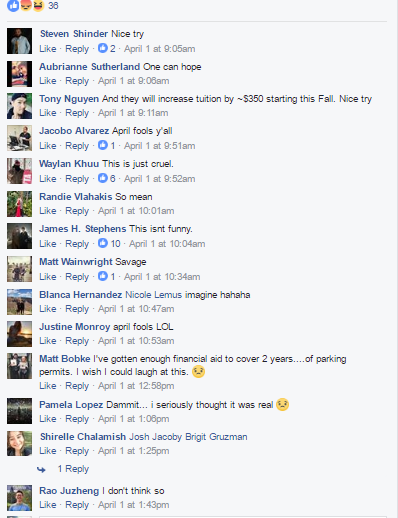 Last Saturday, it was April Fool’s The Tab decided to pull a prank on UCI students and tell everyone that parking fees on campus were to be phased out by next semester. It turns out students at UCI are very critical about their parking costs. While most students went along with the prank, others didn’t take too kindly to being fooled. 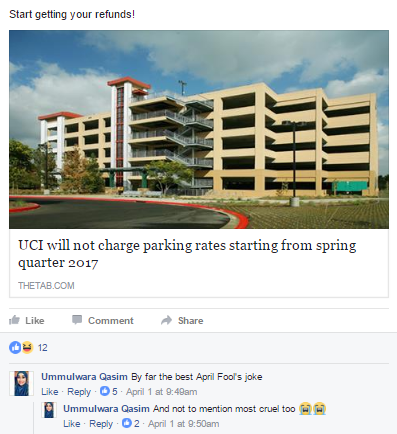 Sadly, UCI parking rates are still pretty much the same price, but hey, at least we didn’t say that they would be going up. Despite hoping that UCI parking will one day be free, here at The Tab we want to clarify that no: UCI parking rates will remain the same. Yes. This article published on April 1st was just a prank.